Whether you’re on a mad dash or marathon shopping spree at the mall, you might need to stop to refuel. But you don’t have to ruin your appetite (and healthy eating habits) at the food court. Try these great options. 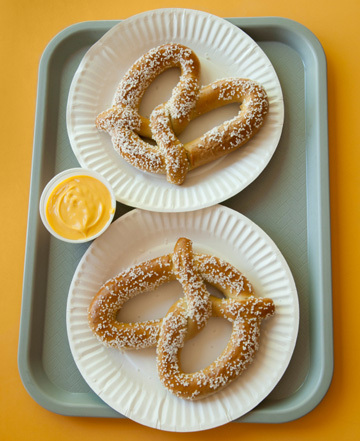 The smell of buttery pretzels, the sensation of savoring a smoothie or devouring a juicy burger is enough to make you forget why you went to the mall in the first place. Don’t let time at the mall leave you nutritionally spent. There are healthier meal options available at the food court. You just have to do a little shopping! Don’t start your shopping trip hungry. Before you head out, make sure to grab a nutritional bite at home that will help keep you satisfied. Go for your fill of veggies at restaurants. You know they’re good for you, but pay attention to added sauces or dressings that can knock them out as healthy choices. Baked and grilled is much better than fried. Keep portions under control. Ask for a kid’s meal or the smaller portion option (many restaurants have a tendency to serve oversized portions). Ask for a healthy menu option if you don’t see one posted. Watch what you drink. Sugary drinks are not the best option, adding unnecessary calories to your day. Go for water or unsweetened tea instead. If you can, pack your own lunch to take with you on your trip to the mall. That way, if you really must have that frozen yogurt or pretzel, at least you know you made yourself a nutritious meal to go! SheKnows scoured the menus and nutritional facts for some popular court-side restaurants. Keep in mind that menus may change or vary based on your location. If you can, before you head out, try to check a few of your favorite food court restaurant websites. The more information you have, the better! One two-fer that a savvy shopper should know? Order two sides — BBQ baked beans (210 calories and 1.5 grams of fat) and a house side salad with Hidden Valley fat-free ranch dressing (35 calories and no fat). That goes a lot better with your healthy eating resolutions than something like the KFC Famous Bowls with mashed potatoes and gravy for 600 calories and 31 grams of fat. Plan to order from Subway’s Fresh Fit Menu that includes eight different sandwich options. You’ll be able to wrap your hands around a 6-inch turkey breast sub on nine-grain wheat bread with lettuce, tomatoes, peppers, onions, cucumbers and deli mustard for 290 calories and 4 grams of fat. The peppercorn shrimp bowl is 170 calories and 5 grams of fat, but it also includes 800 grams of sodium. Instead, you could grab an entree-size order of mixed vegetables for 70 calories, .05 grams of fat and 260 grams of sodium. Mix in the sweet and sour sauce to add 70 calories, no fat and an additional 115 grams of sodium. A good meal at Wendy’s might include adding a small chili (210 calories and 6 grams of fat) to a plain baked potato (270 calories and 0 grams of fat). Or try a grilled chicken Go Wrap (replace the honey mustard with regular mustard), for 230 calories and 7 grams of fat. If you’re simply dying for that Frosty, order the “Jr. Size” for 200 calories and 5 grams of fat, rather than the small (300 calories and 8 grams of fat). You might have to ask specifically, but most Taco Bell items can be ordered “Fresco Style” as a lower-fat alternative. They’ll replace the regular sauce and cheese with a fresh salsa made from tomatoes, diced onions and cilantro. Check this out: The Fresco Supreme steak burrito has 340 calories and 8 grams of fat, and the Fresco chicken soft taco has 150 calories and 3.5 grams of fat. You can’t always plan for perfect food options to be available when you’re on the go. But the more info you have, the better choices you can make, even at the food court! The Social Network Diet: Fad or fabulous?